If you are currently using the Motorola PR400 two way radio, take a look at the charts below to see compatible replacements provided by All Charged Up. The chart below will show the most compatible two way radio for the PR400. While these two way radios are compatible, we will still need to verify the programming of your current radios. Programming is free with your purchase of a new two way radio. The Motorola RDU4100, RDU4160D, RDV5100, and VX-459 improve on the PR400 in many ways, as shown by the green highlighting below. With improved battery life, lighter weight and more compact size, along with meeting more mil spec and IP rating qualifications, and having greater range along with higher quality components make these radios ideal choices for anyone looking to replace their PR400 two way radios. To see the radios, just scroll to the bottom of the page. 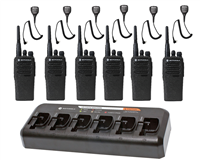 Just click the links below to take a look at each of the product pages for the Motorola RDU4100, RDU4160D, and RDV5100 and the Vertex VX-459 two way radios. By clicking on any of the products below, you will learn more about the two way radio and have the option to purchase it.